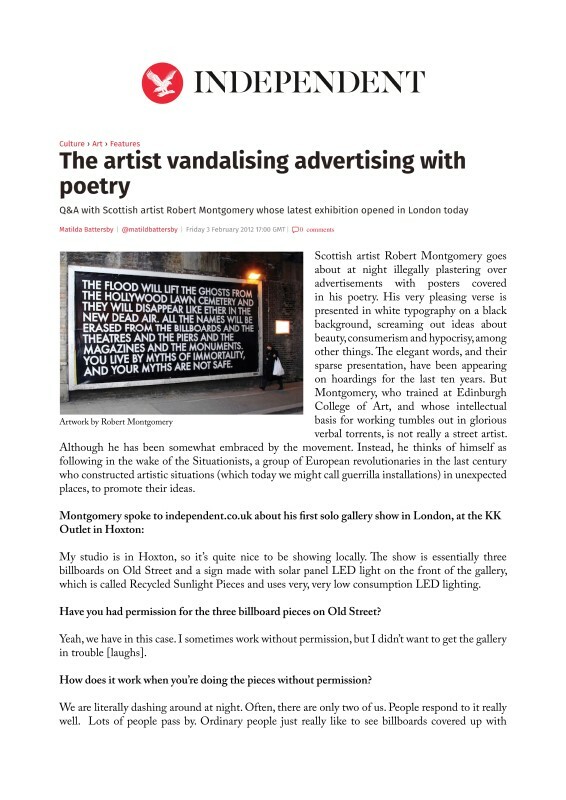 Scottish artist Robert Montgomery goes about at night illegally plastering over advertisements with posters covered in his poetry. His very pleasing verse is presented in white typography on a black background, screaming out ideas about beauty, consumerism and hypocrisy, among other things. The elegant words, and their sparse presentation, have been appearing on hoardings for the last ten years. But Montgomery, who trained at Edinburgh College of Art, and whose intellectual basis for working tumbles out in glorious verbal torrents, is not really a street artist. Although he has been somewhat embraced by the movement. Instead, he thinks of himself as following in the wake of the Situationists, a group of European revolutionaries in the last century who constructed artistic situations (which today we might call guerrilla installations) in unexpected places, to promote their ideas.